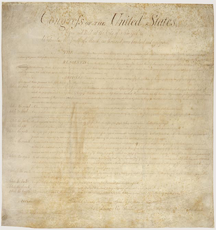 The Bill of Rights — the first ten amendments to the U.S. Constitution. Passed by Congress on September 25, 1789, and later ratified by the States. The Bill of Rights specifies a number of political freedoms, many of which overlap with Virginia Satir's Five Freedoms. Many thinkers have proposed enumerations of freedoms for various contexts. Search for "bill of rights" to find some of them. Photo courtesy U.S. National Archives. When people work together, they often have to act jointly, even though they would make differing choices if they acted independently. This tension between personal perspectives leads people to try to influence each other. In any given culture, some influence tactics are nearly-universally regarded as ethical, and some unethical, but we can debate about most of the rest. Here are the first two of these five freedoms, with applications to influence in organizations. When we limit what people know, by withholding or by delaying dissemination of information, especially for our own benefit, we're probably over the line. Even when the motive is to make the information more palatable to its recipients, we're at risk. Example: Your spouse receives a great job offer, but it's a two-hour commute. So you try to find a nice place to live halfway between your two workplaces. Just after you buy a new place, you get laid off. The company knew all along that your department would be cut, but they didn't want to say anything until a "more appropriate" time. When we limit what people can discuss, whether by policy, pronouncement, or tacit understanding, we're probably over the line. Sometimes these limits even apply to conversations among those who already possess the subject information. These constraints can harm not only the targets of the constraint, but also the organization itself. Example: The boss announces to the team that the deadline must be met, and that we aren't discussing deadline adjustment — just how to meet it. Some deadlines can't change, but this tactic is common even for deadlines that can change. Restricting the discussion for the convenience of some could keep the team from finding a solution that's even better than meeting the deadline. Limiting what people can say deprives us of access to their creativity. For more about the Five Freedoms and their relationship to a sense of organizational safety, see "What to Do About Organizational Procrastination." Would you like to see your comments posted here? rbrenLGAaLTcoAUhpatbLner@ChachSOvtussVAHRDIqjoCanyon.comSend me your comments by email, or by Web form. I offer email and telephone coaching at both corporate and individual rates. Contact Rick for details at rbrenXgMQWQQSioHjftDRner@ChacKZZrMJdCfEKeMAceoCanyon.com or (650) 787-6475, or toll-free in the continental US at (866) 378-5470.